OPTI-FREE PureMoist Solution is a multi-purpose solution suitable for disinfecting, cleaning, and storing silicone-hydrogel contact lenses. The solution contains the HydraGlyde Moisture Matrix. Package contains two 300 ml bottles. OPTI-FREE PureMoist Solution is a multi-purpose solution by Alcon suitable for disinfecting, cleaning, rinsing, moisturising and storing silicone hydrogel and soft contact lenses. The solution contains the HydraGlyde Moisture Matrix, which provides up to 16 hours of moisture and comfort. The effective, but gentle formula of OPTI-FREE PureMoist Solution efficiently removes lipids and proteins and kills germs. 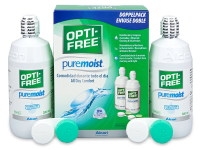 This double pack of OPTI-FREE PureMoist Solution also includes two contact lens cases. The solution should be consumed within six months of first opening the bottle. We also sell this multi-purpose solution in packages of different sizes, including 90 ml, 300 ml, and 3 x 300 ml. Opti-Free PureMoist operates on the basis of a two-phase cleaning system, wherein the lenses are disinfected and impurities are removed. During the disinfection process, microorganisms (bacteria, yeast, and mold) are dissolved with the help of POLYQUAD and ALDOXIME substances. These components of the solution do not interfere with the sensitive eye tissue and eye environment. During the cleaning phase, citrate, and sodium editate help to remove sediments, organic deposits, and limescale. Composition: sodium citrate, sodium chloride, sodium borate, aminomethyl propanol, sorbitol, disodium EDTA, and two moistening substances – TETRONIC and HydraGlyde, which includes a preservative substance called POLYQUAD.